Hamal works at a flower shop but the owner and customers think he's crazy because he can hear, see, and speak to ghosts. This ability is bitter sweet as the ghost, Blue is his best friend and Blue is in love with Hamal. But lately, Blue has been unexpectedly vanishing and all the ghosts are afraid of what's going on. I am such a fan of all these calm, multi-cultural, creative, and beautiful graphic novels I'm seeing these days. The cool, soft color palette and relaxed writing make this story about an accidental necromancer an amazing and wonderful read. 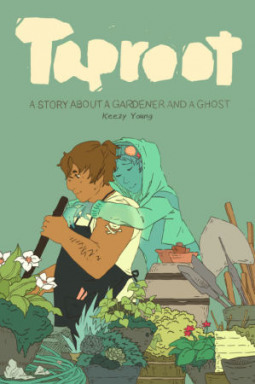 Even when dealing with death, reapers, and ghosts, Taproot never takes itself too seriously; remaining sweet and grounded the entire time. I was a little confused because the terms 'necromancer' and 'ghost hunter' are used interchangeably when I'd always believed them to be very different things. Perhaps if given more time to develop, we could get Hamal's powers clearly defined, learn where they came from, and get some backstory on the other ghosts around him. As it stands, this book was an overall pleasure. 4 out of 5.